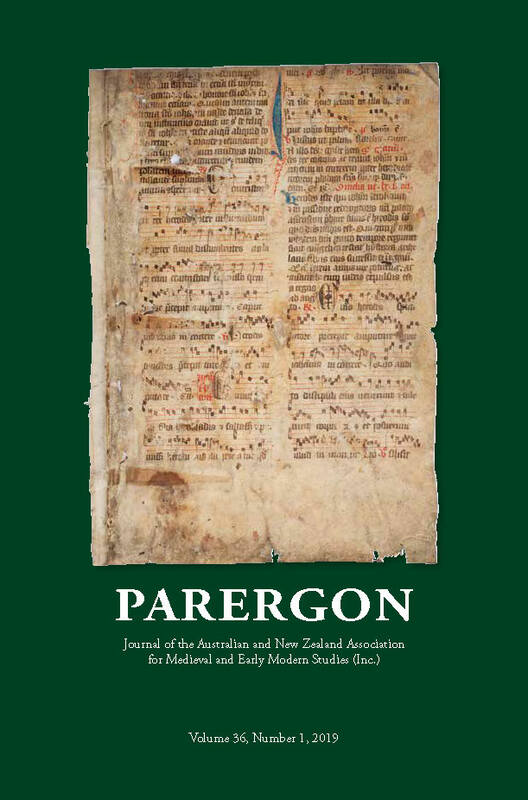 ANZAMEMS is delighted to advise researchers that the latest issue of the Association’s journal Parergon is now out. Issue 36.1 features 7 original research articles and over 40 book reviews. ANZAMEMS members will receive their print copies by post in the coming weeks. Digital content is available via Project MUSE, Australian Public Affairs – Full Text (Informit) and Humanities Full Text. In Shakespeare’s Macbeth, the legibility of a butcher’s designs is succeeded by the monstrous virtue of his replacement Malcolm, who artfully confuses the social world’s assumptions and habits, its ways of recognizing authority and punishing sin. This article explores Malcolm’s powers in terms of a new politics equally expert at manufacturing fear and imitating grace, with reference to witchcraft trials and to analogues provided by Rembrandt and Hobbes. It also considers theories about the workings of this new politics supplied by social scientists, concluding that Malcolm’s strategies for unleashing evil and its remedy similarly sequester and obscure people from each other. The sumptuous Sutton Hoo ship-burial has been much debated since it was discovered nearly eighty years ago, but there is no consensus on its interpretation. Assemblage theory, with its focus on the linkages between people, places, and objects, and the related concept of ‘fittingness’, may provide an alternative explanation that accounts for this ship-burial as both archaeological site and historical event. This article suggests that this ship-burial was a deliberate strategy to cohere and transmit secular political power across the hazardous liminal space between death and succession in troubled times in early seventh-century East Anglia, after the death of King Rædwald. By combining the methods of distant reading (computational stylistics) and close reading, the authors discuss the development of language and thought in Hildegard of Bingen’s visionary works (Sciuias, Liber uite meritorum and Liber diuinorum operum). The visionary trilogy, although written over the course of three decades, raises the impression of a monolithic and seemingly unchanging voice. Moving beyond this impression, the interdisciplinary analysis presented here reveals that the trilogy exhibits interesting differences at the word level which cannot simply be explained through external historical circumstances (e.g. manuscript transmission or different secretaries). Instead, the results raise pertinent questions regarding the trilogy’s internal development in didactic method, style, and philosophy. The important role that the Mediterranean played in England’s development as an imperial power in the early modern period has begun to be appreciated, but more work is required to properly historicize the interactions which occurred during this time and understand their impact. This article argues that to do this it is necessary to move beyond generalized interpretations and examine the impact of encounter at the individual level. Moreover, through examining the experiences of one such sojourner, it demonstrates how a focus on acculturative change can provide novel insights into the consequences of historical encounters between European and non-European peoples. Critical attention to death in Samson Agonistes has been dominated by the question of whether Milton’s drama glorified acts of religious terrorism, a question that involves death but unnecessarily narrows it. I seek to reframe our understanding of Samson by looking not only at his aggressive exploits, but also at his movement towards death. The poem illuminates Samson’s development of what I call a ‘deathly selfhood’, which relies on an interior awareness of who he is, rather than on an outward manifestation of his abilities, and only becomes available to him as he nears death. This article argues that mealtimes in The Book of Margery Kempe establish Margery’s orthodoxy and demonstrate her sanctity. Mealtimes provide Margery with a sufficiently flexible boundary between private and public for her to express her devotion and reach out to people without incriminating herself as a heretic. Medieval mealtimes, symbolizing community and hierarchy, enable Margery to express her sanctity and be accepted by respected figures. As a result, mealtimes allow Margery’s ministry to succeed at a time of religious dissent. This article re-assesses political relations between Alfonso V the Magnanimous (r. 1416–58), King of Aragon, Sicily, and Naples, and the Bosnian duke-herzog Stjepan Vukčić Kosača (r. 1435–66), analysing the period between Alfonso V’s conquest of Naples in 1442 until his death in 1458. It considers political developments in the Eastern Adriatic, particularly relations between Alfonso and Stjepan, and the policies that the king, as ruler of Naples, pursued toward the east, in order to argue that Alfonso’s activities in the Balkans were mainly intended to disrupt the interests of Venice and to solidify his rule over southern Italy. 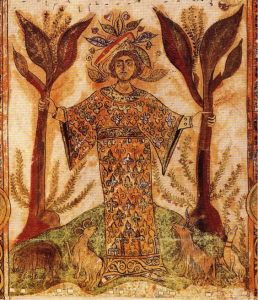 Parergon welcomes article submissions on all aspects of medieval and early modern studies. We are especially interested in material that crosses traditional disciplinary boundaries and takes new approaches. For more information and submission guidelines, visit the Parergon website. This entry was posted in ANZAMEMS, publication on 17 April 2019 by ANZAMEMSComms. This year’s conference of the Perth Medieval and Renaissance Group and the UWA Centre for Medieval and Early Modern Studies will take place on 19 October, 2019. The conference theme is Mental Health in the Medieval and Early Modern World. Modern stereotypes abound regarding how mental health was perceived during the medieval and early modern period ranging from mental illness being caused by sin to the idea that the attainment of mental well-being could only be achieved through the balancing of the bodily humours. But mental health was a more complex and expansive subject of discourse throughout the period that was widely explored in medical treatises, religious tracts and sermons, and prominent in art and literature, which speaks to a more subtle understanding of the human mental state. The conference organisers invite proposals for 20-minute papers. Please send a paper title, 250-word abstract, and a short (no more than 100-word) biography to: pmrg.cmems.conference@gmail.com by 31 May 2019. For further information, see the conference flyer posted below and visit the conference website. This entry was posted in cfp, conference on 17 April 2019 by ANZAMEMSComms. Medieval Institute Publications is inviting proposals for a new book series, Premodern Transgressive Literatures. The Series Editor, Alicia Spencer-Hall, and Editorial Board invite both formal proposals for the series, and more informal queries, from all interested parties. We aim to show, with insistent urgency, the ways in which the premodern can help us make sense of the modern, and the ways in which cutting-edge modern paradigms can help us better understand established, canonical premodern texts. This series is acutely aware of the role of the scholar in the production of history and the crucial importance of the context of scholarly work: the Academy, with its unique characteristics, both positive and negative. As such, Premodern Transgressive Literatures makes space for provocative discussion about the business of producing—and teaching—transgressive work in the neo-liberalised Academy. We welcome monographs from established and early career researchers, alongside collections of thematic essays, scholarly editions and translations with substantial introductions and apparatus. If you have any general queries or questions about the series, in the first instance please contact Shannon Cunningham (Acquisitions Editor for Medieval Institute Publications), shannon@smcunningham.com. Please also feel free to contact the Series Editor, Alicia Spencer-Hall, to discuss the series informally and answer any questions regarding academic fit and so forth: aspencerhall@gmail.com. This entry was posted in cfp, publication on 9 April 2019 by ANZAMEMSComms. Applications are invited for a short‐term Visiting Fellowship at the Centre for Classical and Near Eastern Studies of Australia (CCANESA) at The University of Sydney, for tenure during the 2020 Australian academic year. The Fellowship is valued at AU$4,000. The Apollo Visiting Fellowship is open to applications by young scholars of Classical Archaeology (defined as the archaeology of ancient Greece and Italy) to come to Sydney to consult with academic experts in their field and to work on their research at the Centre for Classical and Near Eastern Studies of Australia at the University of Sydney for a concentrated period. The Fellowship is open to young scholars from any country outside Australia who are in the final stages of writing of their thesis or within three years after the award of their PhD. The Fellow may determine the length of their stay but it is hoped that they will be able to remain for a minimum of two weeks. It would be desirable if some of their stay coincided with an academic semester (roughly: March – June; August – November). Applications close Friday 31 May 2019. For further information about the Centre and to apply, please see the CCANESA website. This entry was posted in grant on 9 April 2019 by ANZAMEMSComms.